Fill a large saucepan with a few inches of water and bring to a slow simmer. 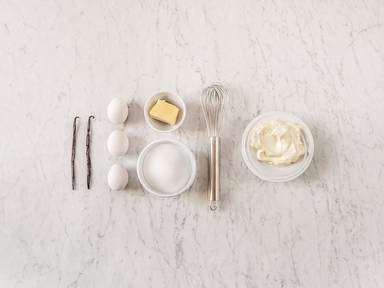 In the bowl of stand mixer or a large mixing bowl, combine egg whites and sugar; place bowl over the pot of water. Heat mixture, stirring constantly, until it reaches 70°C/160°F; the sugar should be completely dissolved. Transfer bowl to stand mixer fitted with the whisk attachment. Gradually increase speed to high until egg whites form stiff peaks and the bowl and meringue have cooled to the touch. With the mixer still running, add vanilla bean seeds, then add butter gradually until all of it is incorporated and the buttercream is light and smooth. This can take time due to the size of the batch. Store buttercream in an airtight container in refrigerator if not using immediately, however it is best used fresh, as its color and texture can change when stored.